Last Fall I broke the news to the world that I was pregnant. I remember being overcome with emotion when I learned my due date was June 16th, because for the past 10 years June was a month of grieving. But four weeks ago today, our lil girl arrived. On Shannon’s birthday. June 21st. And so it was. I now have two angels…one in heaven, and one in my arms. Here’s to breathing new life into all we do. And to remembering there is a reason for everything. Today would have been Shannon Elizabeth McNamara’s birthday. The poem below was written by a dear friend of the McNamara family, Sharon Rickerson. Sharon also has written a unique poem the previous 9 years that Shannon has been gone. If you live in the Chicago area, check out the Daily Herald tomorrow, as this poem will be published there. Happy Birthday Shan; we miss you so much! Note from Erin: June is a rough month for all who loved Shannon, with her death happening on June 12 and her birthday on June 21. I feel her birthday is so symbolic however, since today is the summer solstice. This is the first day of summer, and the day of the year with the longest period of daylight. Isn’t that symbolic of how much light Shannon has shed upon this world in her short life? Ten years ago, this month, I lost one of my dearest friends to homicide, but amidst the sadness, a light flickered in the distance. Gradually, yet deliberately, a silver lining began to sparkle around a very dark cloud, and from it emerged Girls Fight Back. The storm of June 12, 2001 was over, but not forgotten. The rainbow afterwards has been glorious–and thanks to the many people who have believed in our mission along the way, it has shone brightly for an entire decade. How do we properly celebrate 10 years of changing lives…even saving lives? 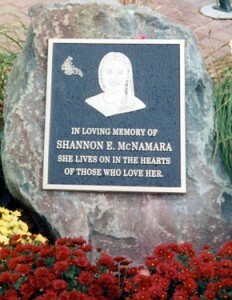 How do we begin to pay tribute to the gentle soul of Shannon McNamara, who inspired this entire campaign? Especially a movement that is global in scope, reaching women of all ages? Thanks to a little thing called the Internet, I think we can pull off this celebration quite swimmingly and include our friends across the world. How? We’re gonna throw an e-party! 1. BLOG: Throughout the month of June, we will be featuring our greatest influencers on the GFB blog. They will be sharing their thoughts, memories and insights from our adventures since 2001, as well as their ideas and hopes for the decade ahead. These people have deep insight into why this movement has worked and maybe even some embarrassing/fun/random tales for your enjoyment. (Note: all hilariously humiliating posts will likely feature me…) The folks blogging this month will be friends, fans, business comrades and super-fans. All of whom have contributed so much to GFB. Without their influence, GFB would not be what it is today. To all of them, I say THANK YOU. 2. TWITTER: If you’re a tweetin’ kind, be sure to search and save the hashtag #GFB10. It you tweet a happy birthday message to GFB this month, be sure to use that hashtag so we can re-tweet you! 3. FACEBOOK: We’ll also be posting the blog posts on the GFB Facebook page, as well as having fun giveaways and contests throughout the month. If you’re not already a fan, please come hang with us at our digital domicile.